Description: With about 2 million tortoiseshell cats in the United States, these special felines tend to be strong-willed, a bit hot-tempered, and often very possessive of their humans. Other words used to describe torties are fiercely independent, feisty and unpredictable. In Tortitude: The BIG Book About Cats With a BIG Attitude, cat expert Ingrid King (The Conscious Cat) brings her professional and personal experience to explore why these cats are so special. With expert insights combined with stunning photography and passages dedicated to the cats and their passionate guardians, King offers a new perspective on these exceptional cats. Again, I am starting a review by first noting the cover. I am a big book cover person, as well as being a massive animal lover, and this cover just makes me feel warm and happy inside. 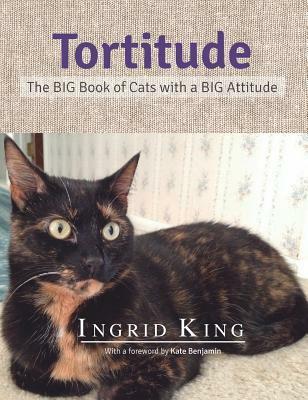 (I believe this is author Ingrid King's own tortie Allegra gracing the cover.) If you are a cat lover yourself, seeing the book alone will make you want to reach out and grab it. So do it! Tortitude is the perfect gift for the cat lover in yourself or in your life. The photos throughout the book are stunning; they are from cat guardians all over the world who answered Ms. King's call for help in submitting pictures of their beloved felines. Pretty awesome, I would say. But this is more than just a coffee table book of lovely photos. It is chock full of information on tortoiseshell cats. * Tortoiseshell cats are not a breed but rather are named for their distinctive coloring. This coloring consists of a combination of patches of black, brown, amber, red, cinnamon and chocolate. * Male torties are very rare due to the fact that two X chromosomes are required to produce the black, gold and orange coloring. Since male cats must have one X and one Y chromosome, it's almost genetically impossible for a male to inherit the tortoiseshell coloring as a male tortie must have an extra X chromosome. * Tortoiseshell marking can appear in some 25 cat breeds. * It was believed that torties were able to see into the future and those who dream of a tortie will be lucky in love. One of my favorite bits of information in the book was a quote from Dr. Fern Crist, a veterinarian. Dr. Crist stated that torties "are the redheads of the cat world. . . beautiful but short-tempered and quick to wrath." That quote makes this redhead chuckle and feel even more akin to the lovely tortie. On each page of the book, the tortie is identified (I love reading their names) and a feline quote is placed below the photo. It really brings the book together nicely. Ingrid King has been a friend of this site since I first read Buckley's Story and I find her to be a warm, delightful person who relates to cats in a way very few people do. She brings her personal and professional experience to every project she works on and, most especially, her love and understanding. Tortitude is no exception. Lastly, Ms. King and this book have been endorsed by Jackson Galaxy. I am a huge fan of Mr. Galaxy (I'm geeking out over his endorsement!) and if the "Cat Daddy" himself sings your praises, that is something pretty special. Tortitude: The BIG Book of Cats with a BIG Attitude is available at major booksellers. Find Tortitude: The BIG Book of Cats with a BIG Attitude on Goodreads. FTC Disclosure: The review copy of this book was provided to me by the publisher in exchange for a fair and honest review. The provision of this book did not affect the outcome of my review. I was neither paid nor compensated for this review.